Men’s tuxedos. For over 120 years, they have been the pinnacle of high-class menswear. They traditionally came in mostly black, but are now available in a very wide range of colors. People may not know them well, but Men’s tuxedos have become essential! Well, men’s tuxedos might not be something that you really bother to know a whole lot about. But what I do know is that every man worth his salt wears one during important rites of passage in his life. These include baptisms, proms, weddings, honorary formal dinners, and more. Fit is just as important as style! The fit should definitely be one of the main things to consider when deciding on your men’s tuxedo. Right now, fitted tuxedos are all the rage; they taper in the waist, feature smaller shoulders, and lend a slimming appearance to the wearer. However, if you’re a larger fellow, perhaps consider a standard fit, which compliments a larger build without hiding it behind baggy clothes. But for the last several years tuxedos have been seeing a steady decline in the number of people who wear them, even to weddings. This is partially due to the trend of ‘dressing down,’ making suits acceptable for taking your vows in. I’m on board with that, but there’s a disturbing trend of brides dressing their men up in jeans and button-up shirts, sometimes with suspenders. Now, to each their own, but I would think the most important day of a man’s life deserves the best outfit. It’s a wedding, not casual Friday. Picture James Bond wooing the newest Bond girl in that lame outfit; cool superspy? Maybe, if his job was working in a cubicle. 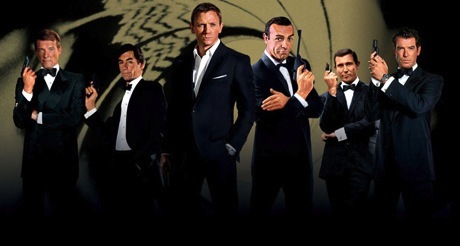 Seriously; Bond in anything other than a tux would NOT BE BOND! But, I digress. Despite the dress-down trend, men’s tuxedos continue to be the top-notch way for a man to dress up. When my brother in law was getting married, I caught wind that he was going to wear shorts and a button-up shirt. I insisted on wearing a suit to the wedding, and he was afraid of me out-dressing him, so he wore a suit too. And you know what? His mother, his new wife, and later he himself thanked me for driving him to dress in something more presentable. Later, when you’re looking at your wedding pictures, you’ll be glad you picked the best: one of the tried and true men’s tuxedos.